One of the hottest topics around right now is so-called “fake news,” the recent explosion of intentionally false or highly biased news. Many of these stories are fabricated and then packaged and distributed to look like legitimate news. Librarians are major players in the fight for REAL news and information literacy. A recent Stanford Graduate School of Education study found that most students have a hard time distinguishing between credible and unreliable news articles. Some even have trouble distinguishing paid advertising from news reporting. Another study, by the Pew Research Center, finds that a majority of US adults are getting their news from their social media feeds, which certainly do not present all sides of a story. Throughout history, various fabricated stories have been presented as truth. In the 1880s, Joseph Pulitzer and William Randolph Hearst practiced yellow journalism, using lurid stories and sensationalism to attract readers. For a long time, tabloids such as the National Enquirer have done the same for readers in line at the grocery store. The current combination of a divided electorate and rampant social media has led to the deluge of questionable reports. Fake news can take several forms. Some stories are intentionally misleading, and are packaged in a way that makes them appear credible. Other stories, often called clickbait, are just intended to lead readers to a specific site. Many stories may seem to contain real facts, but the perspective may be biased. There are also sites that specialize in parodies or satire. 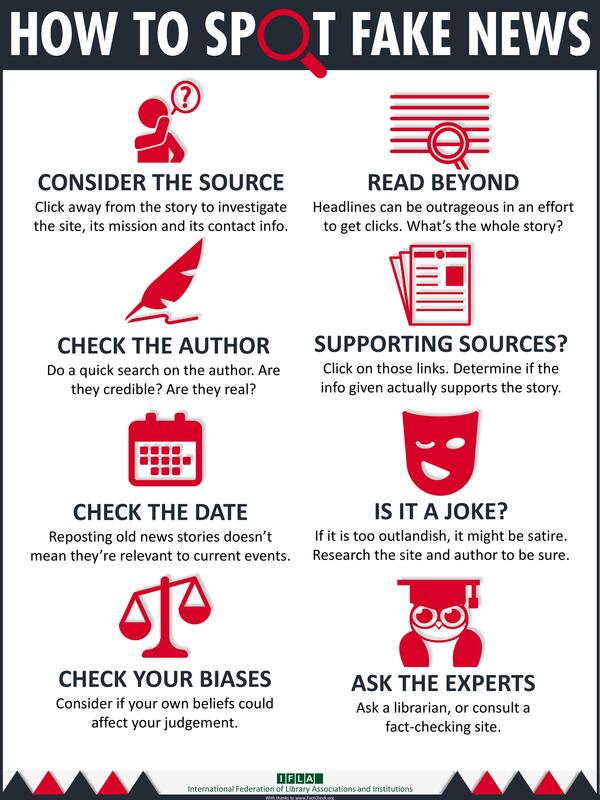 The International Federation of Library Associations and Institutions (IFLA), a leading organization for the library and information professions, has put together a simple graphic describing how to spot fake news. The first step in evaluating a story is to consider the source. Check to see if that story really is from a valid source, or if it is just someone using a similar name or URL. Read the whole story. Sometimes a headline will draw you in, but you will find there is more to the story if you dig deeper. Find out more about the author. Do a little checking to see what else they have written, and whether there is a reason for their point of view on a topic. When was the story written? Is this current “news” or a rehash of an older event? Is this a joke? Some stories from satiric websites go viral and certain readers may not understand or recognize the humor. And finally, determine the point of view of the story, and evaluate the role your own feelings are playing in your interpretation of it. It is not appropriate to call a story fake news just because you disagree with it. Fern has worked for Brodart as a Collection Development Librarian since 1990. She also did a stint as a reference librarian in the CNN newsroom and is married to a newspaper librarian. Click here for more.